The prestigious Hotel Du Vin has recently launched a new autumn menu and the Winchester Bloggers were invited to this stunning location to sample what's on offer. James West reports. We'll start with an embarrassing admission. Despite it being one of Winchester's best-loved institutions, myself and Kelly had never eaten in the Hotel Du Vin restaurant. Even more shamefully, I'd never even been inside the building. It was certainly time to right that wrong by trying the new Autumn menu. We arrived at dusk on one of those late autumn evenings when winter's pull could be felt strongly. The exterior and lighting of Hotel Du Vin could not be more inviting. The effect of walking inside is equally memorable - taking those few steps from the road feels like entering into a different place entirely. Buil in 1715 and beautifully restored, the Hotel is the perfect blend of history and modern comfort. As we were led to the table, our attention was inevitably drawn to the beautifully lit courtyard garden. With Christmas approaching, we immediately made plans for a huddling beneath a patio heater and enjoying a drink on a freezing, dry evening. We were trying the two-course prix fixe menu which had been revamped for Autumn. Our respective tastes meant the food selections were simple: Kelly opted for the french onion soup while I chose the steak tartare. The onion soup was sensational: stunningly rich and beefy, topped with strong cheese - exactly what you'd hope for from this dish. Just as Kelly had found the perfect starter, the steak was similarly "up my street". 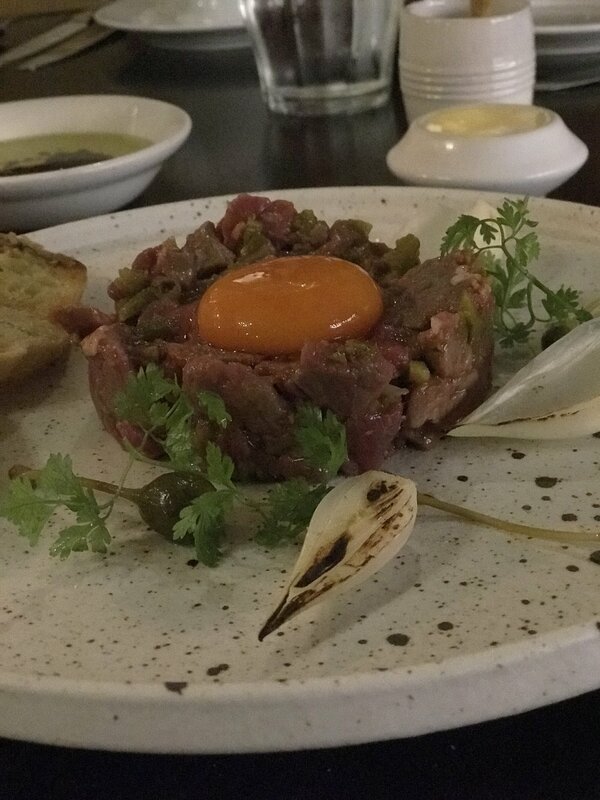 The generous portion of quality steak was mixed with acidic and tasty gherkin and cappers, while the egg yolk which topped the steak added a luxurious creaminess to each mouthful. For our mains, I order fish stew while Kelly had beef bourguignon accompanied blue cheese potatoes. My bouillabaisse featured a fantastic range of fish: red mullet, bream, monkfish and king prawn while the tomato sauce offered a rich, smoky flavour which complimented rather than overpowered the fish. The beef dish was also perfectly judged, with tender meat, punchy gravy and the incredible blue cheese rounding off the flavours perfectly. Overall, this was the ideal introduction to Hotel Du Vin and the incredible food, setting and hospitality on offer. We'll definitely be visiting on a regular basis. If like us you haven't yet experienced Hotel Du Vin, the fixed-priced menu is the perfect introduction. And like us, it's likely you'll be back again. Maybe we'll see you for a festive drink in the courtyard. View the full Hotel du Vin Autumn menu and make a booking here.